1 Heat the milk until almost at boiling point. Add butter and set aside to cool to room temperature. In a large bowl, combine the flour, yeast, sugar and salt. Make a well in the centre and add the egg yolks and the milk mixture. 2 Bring together with a wooden spoon, turn out on to a floured surface and knead for 5 minutes. Return to the cleaned and oiled bowl, loosely cover with oiled cling film and allow to prove for one hour until doubled in size. 3 Turn the dough out, knead for a minute and then divide into quarters. Roll one of the quarters out to a circle measuring about 26cm. 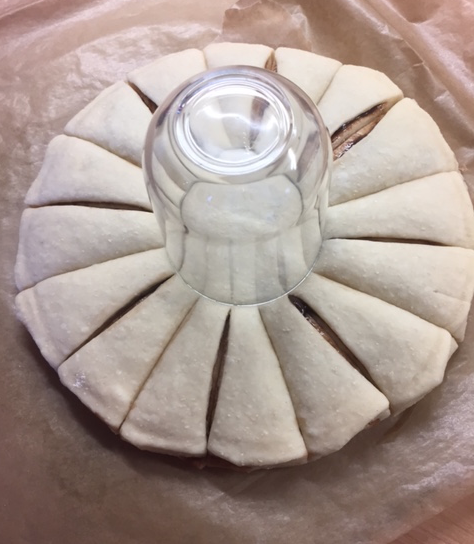 Place on a large sheet of greaseproof paper and mark a circular indentation on the dough using a 22cm cake tin. 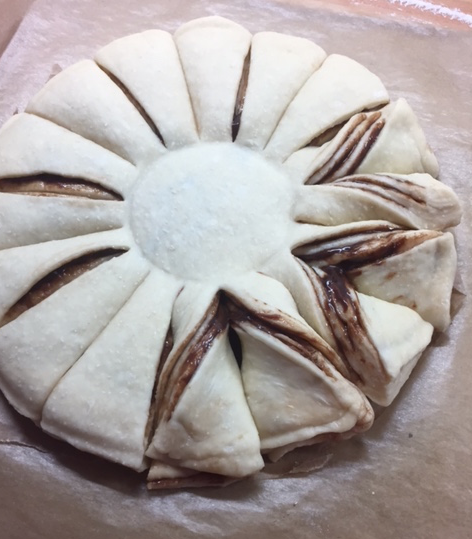 Spread a third of the chocolate filling over the dough within the 22cm circle. 4 Roll out another piece of dough to a 26cm circle and place on top of the other circle. Mark another 22cm circle on top of the dough and spread with another third of the filling. Repeat with the third and fourth piece of dough and finish with the remaining round of dough. 5 Mark the 22cm circle as before then cut all excess dough away, leaving you with a layered 22cm circle. Place a 7cm glass, rim-side down in the centre of the dough and leave it there. Make 16 cuts from the rim of the glass through the dough to the outside of the circle to create the petals. 6 In pairs, make another three cuts in a chevron shape cutting from the small circle downwards but not all the way through. 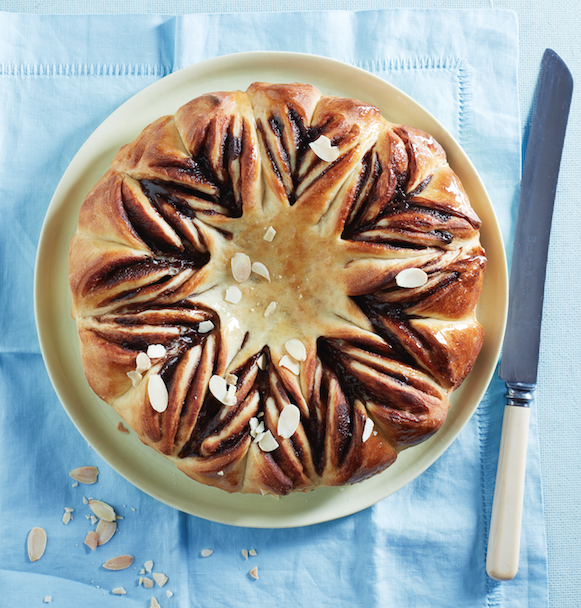 Take hold of two cut slices that are touching and twist each outwards to create a ‘V’ pattern. 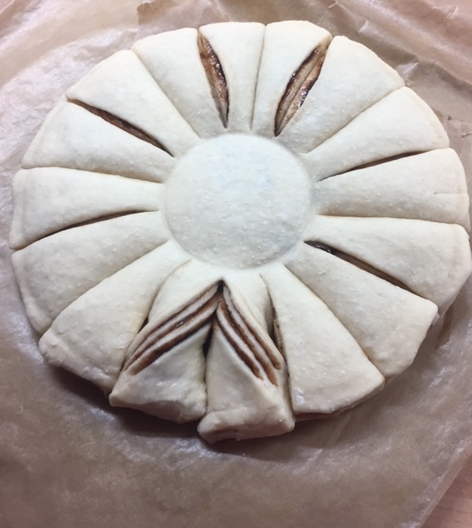 Continue all the way around the bread until each petal has been twisted and you have a flower pattern. 7 Preheat the oven to 200°C/R6. Carefully place on a baking sheet and allow to rise for 20 minutes or until slightly puffed up. Bake for 15-20 minutes until risen, golden and hollow sounding when tapped on the base (be careful not to get hot chocolate on yourself!). Allow to cool a little before brushing with the syrup. Scatter with the almonds and serve. Cook’s tip: Take care when removing the bread out of the oven as the chocolate will be extremely hot.